Another serious painter who considered the crossover into posters a natural extension of his artistic talents, Bonnard created unforgettable images that convinced other artists, most notably Toulouse-Lautrec, to explore the lithographic medium. 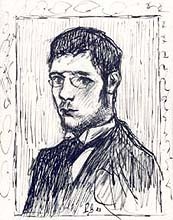 Born outside of Paris in 1867, Bonnard's family planned for him to enter the civil service as did his father. But his attraction to the artist's lifestyle and what he called the "freedom to live as one pleases" overcame his sense of filial duty. Bonnard was one of the vibrant community of artists that populated Montmartre. He belonged to the Nabis, a group that included such future luminaries as Maurice Denis, Paul Ranson, Henri-Gabriel Ibels, and Edward Vuillard. Pursuing a decorative style inspired by the work of Paul Gaugin, they opposed the isolation of fine art and believed instead that the meaning of art lay in its integration into daily life. Bonnard was most prolific in poster making in 1889-1902 when he produced more than 250 lithographs. His posters, like his paintings, were heavily influenced by Japanese prints and the styles of Gaugin, Picasso, and Seurat. His strong designs and unparalleled talent place him near the pinnacle of poster designers and his works among those most unique and sought after.